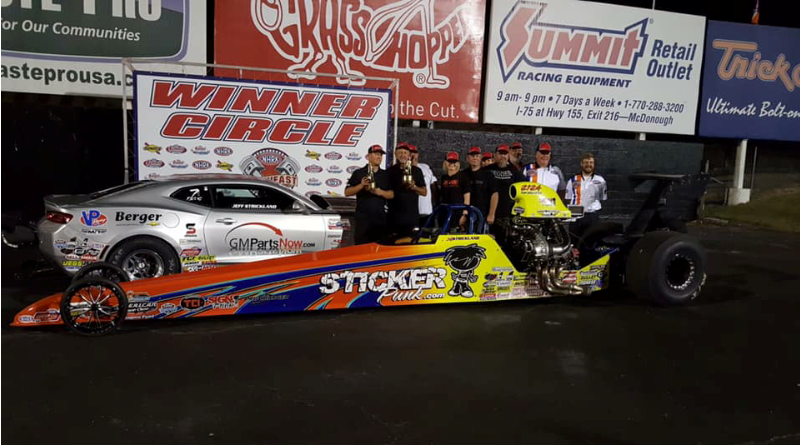 Jeff Strickland doubled in Stock and Top Dragster to highlight racing at the Division 2 Lucas Oil Drag Racing Series event at Atlanta Dragway. Glen Treadwell, Sorrento, Fla., ’00 dragster, E/ED, 8.328, 158.02 def. David Rampy, Piedmont, Ala., ’02 Ken Keir, A/EA, 7.250, 171.86. Emily Volkman, Campobello, S.C., ’69 Camaro, SS/GA, 9.994, 129.77 def. David Rampy, Piedmont, Ala., ’87 Camaro, GT/LA, 10.199, 127.94. Jeff Strickland, Red Bay, Ala., ’19 Chevy Copo, FS/C, 9.500, 130.76 def. Daniel Young, Palm Harbor, Fla., ’94 Pontiac, C/SA, 10.672, 126.27. Jeff Strickland, Red Bay, Ala., ’14 American, 6.368, 198.35 def. Clint Riley, Greenville, Fla., dragster, 7.356, 181.35. David Tatum, Palmetto, Ga., ’03 Chevy Truck, 7.209, 188.62 def. Nick Rabon, Florence, S.C., ’08 GTO, foul. Raymond Miller, Spring City, Tenn., ’17 Miller, 8.944, 173.94 def. Billy Walker, Loganville, Ga., ’00 Udnercover, 8.903, 163.65. Craig Porter, Silver Spring, Md., ’04 Mustang, 9.920, 162.06 def. Tyler Caheely, Rock Spring, Ga., ’02 Corvette, 9.924, 162.35. Jonathan Anderson, Williamson, Ga., ’05 Pontiac, 10.938, 126.03 def. Laurel Morris, Rogersville, Ala., ’90 Pontiac, 10.936, 134.34. Maverick Palmatler, Deland, Fla., ’17 Mike BOS, 18.748, 22.98 def. Madison Wilson, Laurens, S.C., ’15 BOS, foul. Dylan McNicol, North Pout, Fla., ’06 Halfscale, 9.100, 70.93 def. Alayna Carden, , , ’18 BOS, 8.932, 73.52. Malachi Edwards, Maysville, Ga., ’10 BOS, 12.028, 53.31 def. Kylan Bator, Boyton Beach, Fla., ’07 Hardens, 12.077, 53.86. For more NHRA Lucas Oil sportsman drag race results, click here.